I have a bit better internet connection today so let's see if I can get this posted. I am in the land of steam but didn't have time to check out any current photos I took so this one dips into the archives from when I was able to see Locomotive 765 that is owned by the Fort Wayne Railroad Historical Society in Indiana. 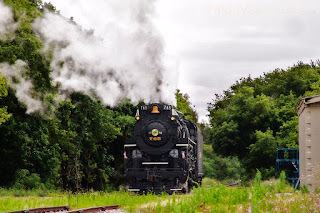 It's a beautifully restored locomotive and it was great to be able to see and chase it that day.